Need a sliding door upper hinge for my 71 Chevy G10. Still no luck finding one. The reason I want a different hinge is because the nylon piece that rides on the track is badly worn and causes the door to drop 1/4 inch when it opens. I had already extended the hinge by 3" to clear the 255 70R-15S on 9" Cragars but I came across a set of Mickey Thompson 12.5 in wides on 15X10s which stick out quite a bit more. So I spent most of the day yesterday extending it again by 5". It came out real nice, installed it only to find out it still doesn't clear. Does anyone know how long the extended version of the slider hinge is? I would appreciate it. Where can you buy them? 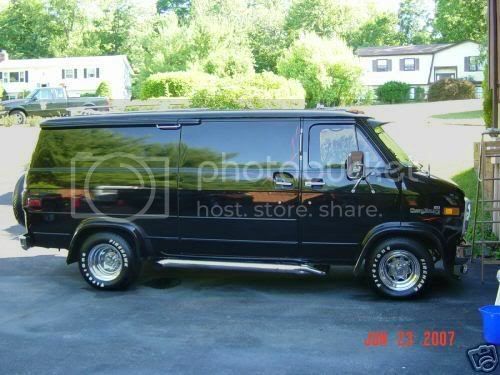 Im looking for the top u shaped door hing for the side sliding door on my 1980 G25 Vandura. It seems to be the longer of the 2 options, any idea where to find one as i am havin serious troubles finding one. Hey Pat - You just need the nylon piece? Says item out of stock...I ended up replacing it with a grooved nylon wheel and it works much better. It's out of stock because I bought it! If you search by part number, you'll always find them.